As a kidI used to drape a blanket over my shoulders and run around the house pretending that I was Superman. Id spend hours on end dodging super villains (parents) and evading real-world dangers (the dog's land mines out back)all the while contemplating my flight from one couch to the other. Todayat the Misano World Circuit Marco Simoncellithat childish imagination is alive and wellonly Ive replaced that snot-filled blanket with Aprilias absolutely stunning RSV4 RF. 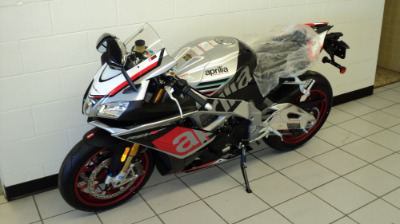 And instead of SupermanIm passing myself off as Aprilias next World Superbike Champion. Im Leon freakin HaslamI tell myself as I relinquish my hold on the brake lever and begin tipping the bike into the Misano Circuits turn 16. I believe that thought to be more true as I tug on the RSV4s throttlethe bike's front end climbing off the ground as I tuck in behind the bikes redesigned bubble and accelerate down the short front straight. Moments later I glance down at my lap time (displayed via an iPhone using Aprilias V4-MP app! )only to be brought back to reality and reminded of why after this lap Ill be heading back home and writing a review on this bike rather than flying over to Assen for the next World Superbike round. For that lap thoughAprilias RSV4 RF made me feel like a superheroas if I could do no wrong. 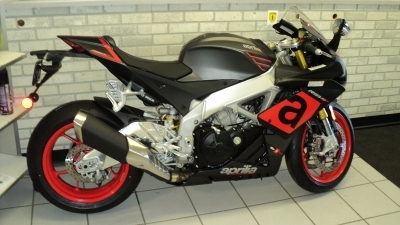 The Aprilia RSV4 is that good. Both the 2016 RSV4 RR and RF are newbut step up to the RF (shown) and you get forged aluminum wheelsOhlins suspensionand Aprilia's Superpole graphic. The 2016 RR and RF are an evolution of the RSV4 models that Ive had a love affair with since day onethe RF adding hlins suspensionforged aluminum wheelsand Superpole graphic to an already sublime package. Aprilia has found a few extra horsepower for both modelstweaked the ergonomicsand refined the electronics for increased rideability over the duration of a race or trackdayall using information and ideas gathered from Aprilias Racing Departmentwhich - oh by the way - has earned four of the last five World Superbike Championship manufacturer titles (three rider championships). Aprilias Product Development ManagerPierro Soattirecaps each of the changesstarting at the engine: This year the Superbike and Superstock motorcycle have to be closer to the production oneso you can change less things. One of those things is the airboxso basically we developed a production airbox that is as close as possible to the former superbike one. The most important thing with an airbox isnt the dimensionbut the trajectory of the wind; In order to reduce lossesthe trajectory of wind needs to be straight as possibleso on this airbox the air filter was moved from laying downwhere air had to make a cornerto straight up and downhe reveals. If ever you were curious about how regulations and racing play a hand in the development of production motorcycleshere's your answer. The biggest changes for the 2016 RSV4 are inside the 65-degree V-4 engine. Camshafts are lighteras are the pistonsconnecting rodsand upper crankcase. The bike is claimed to have 201 horsepower (at 13000 rpm) at the cranka 16-horsepower jump compared to the last model. The fixed funnels for the RSV4's variable intake system are shorterand the moveable ones largerso as to not sacrifice midrange torque. Further downyou'll find reshaped camshafts that are forged instead of cast for reduced weightplus new valve springs and lighter caps. Titanium intake valves are larger (33mm versus 32mm)while exhaust valves (26mm) are now made from titanium rather than steel. As is the case with the 2015 Yamaha R1combustion chambers are CNC machinedwhich keeps the compression ratio very constant for each cylinder and allows Aprilia to control the combustion in a better way. Soatti says that this process absolutely adds to the production costsbut that it is also "one of the most important changes for the engine." The RSV4s pistonsPankl connecting rodsand upper engine case are all lighterthe latter now featuring an optimized ventilation system that reduces pumping losses. A completely new oil circuit uses check valves to bring oil to different points of the engine only when its necessary (read: at higher revs). For examplewith the gearsits not necessary to have a very high flow of oil when you are going lower than 6000 rpmbecause theres not that much load then. So it makes a check and saves oil flow in these parts at lower rpmSoatti says. 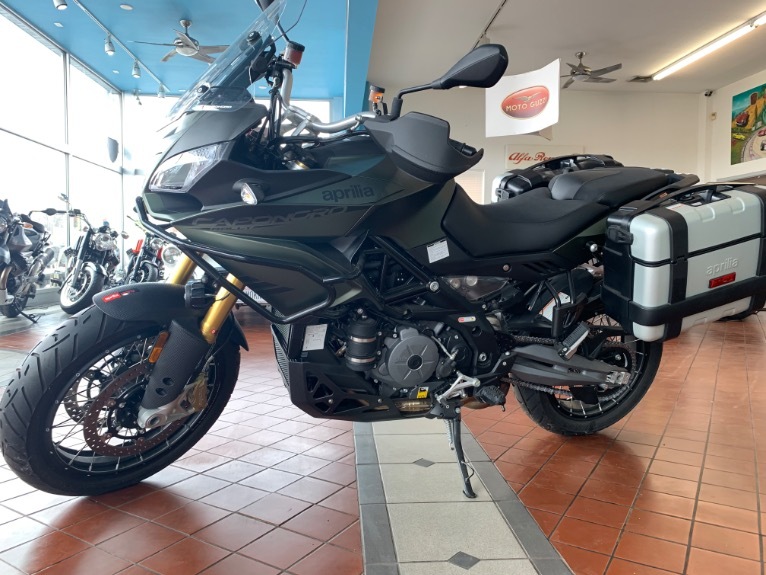 The RSV4s 65-degree V-4 engine produces around 85 foot-pounds of torqueenough to make the bike want to wheelie practically everywhere if Aprilia left the geometry as is. Fortunately (or unfortunatelydepending on your maturity level)they haven'tultimately lowering the engine 5mm via the RSV4s adjustable engine mount systemand lengthening the swingarm by 13mm (the distance between swingarm pivot to the rear axle is actually just 4mm longerbut you can use all 13mm of added room on the adjuster if you'd like). Thenso as to not compromise agilityAprilia changed the offset of the triple clamps from 30mm to 32mmwhich subsequently reduced trail and bumped mid-corner steering quickness. 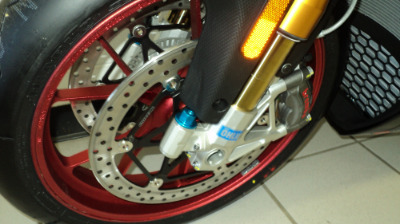 We also moved the axle 2mm backwards to position the front wheel in same position as beforeSoatti says. Aprilia lowered the center of gravity and lengthened the swingarm to counteract the effects of the added horsepower. 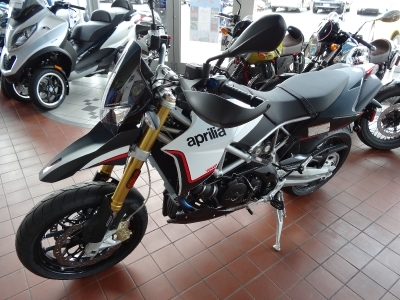 The engine now sits in the lowest position available with Aprilia's adjustable engine mount system. Handling is not Ducati 1299 Panigale lightbut admirableplus the RSV4 chassis provides more feedback than anything in the category when cranked over. 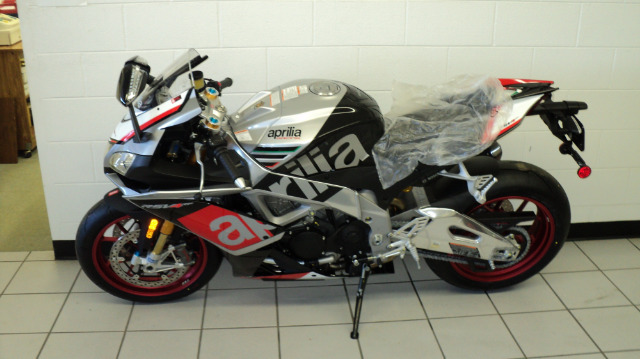 The electronics were recalibrated for the same reason that the chassis was tweakedto counterbalance the V-4s bump in powerbut also as a result of what Aprilia had found in joint tests with its Superbike team. Thereit found that its racers preferred less engine braking and a smoother on/off throttle transitionchanges that made the bike easier to ride during longer sessions. The ECU's Road map was jettisoned for a Race mode thats actually the smoothest of the threewithagainless engine braking above 6000 rpm and a more seamless on/off throttle transition for riderand tireconservation. Track and Sport riding modes remaineach now granting access to all 201 horsepowerand only slight differences in the way that power is put down. 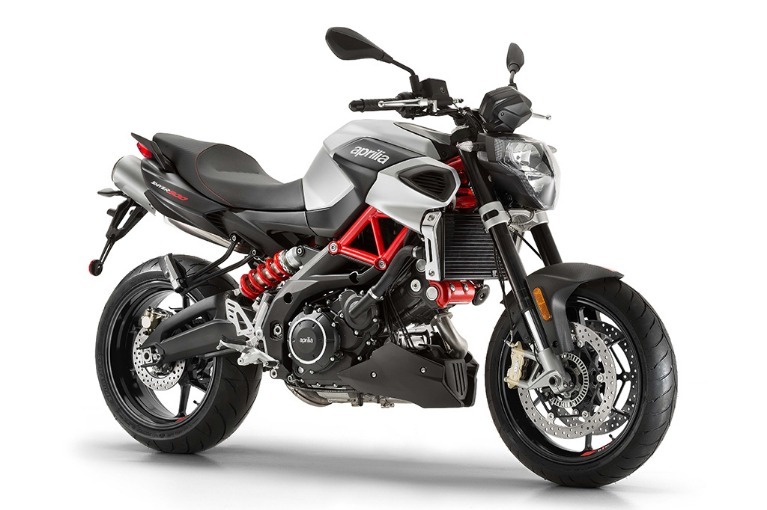 The handlebars are taller and more flatwhich takes some weight off of the riders wristsplus Aprilia has redesigned the front fairing so that it provides better wind protection. New rear mirrors are larger and house LED turn indicatorsthough they were removed for the track portion of our testso no word on how they work just yet. AdmittedlyI didnt feel the effects of the new clip-on angle or reshaped fairing during my four twenty-minute sessions at the Misano Circuitnoting more than anything that the RSV4 is still tight for anyone over 6-feet tall and difficult to wrap your oversized body around. 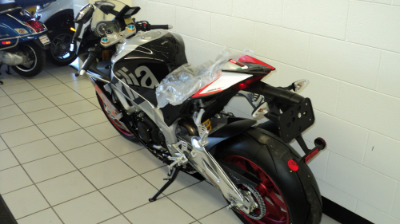 For comparisonYamahas new R1which Id just recently rode at Eastern Creekfelt noticeably more accommodating for a taller rider and a bit more aerodynamic when in a tucked position. It'll be interesting to see how the fairing affects longer stints down the highwayhoweveras Aprilia says that the new design will also reduce the air pressure on the body and helmet when not tucked in. The RSV4's front fairing is redesigned for better aerodynamics and its clip-ons raised for less weight on the rider's wrist. We didn't really notice either change at the tracknoting that the bike still feels a bit small for anyone over six-feet tall. We enjoy the bike so much that we'll overlook that. The bump in power is more obviousthe 2016 RSV4 jumping off the corner with more aggression than before and not going flat as early as the previous model did. The V-four engine doesnt feel as peaky as an inline-fourand instead has smooth delivery of power plus very tractable character that continues to promote smooth drives off the corner. 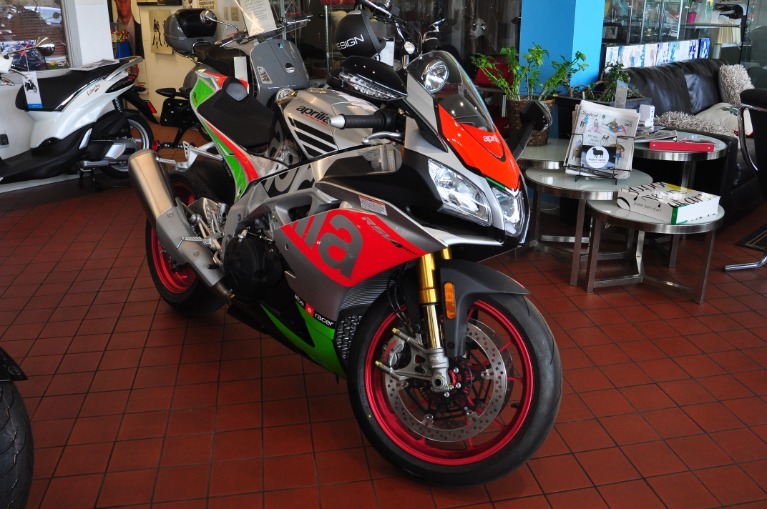 The Aprilia Traction Control (aTC) and Aprilia Wheelie Control (aWC) systems that come as part of the RSV4s aPRC (Aprilia Performance Ride Control) package are quick to intervenethe dash flashing quite vigorously at nearly every corner exit. Even when the systems are in the lower settings range (1 and 1respectively)the cut in power is fairly abrupt if compared to Yamahas R1but not overly so if compared to Ducatis 1299 Panigale. 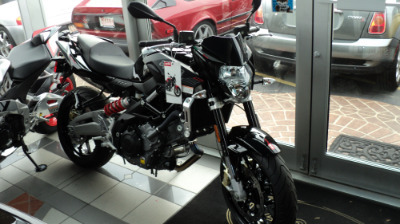 The differencereallyis in how the slide control and traction control on the Yamaha lets the rear tire slide a bitthen manages that slidewhereas traction control on the Aprilia feels like it doesnt want you to put the bike sideways at all. 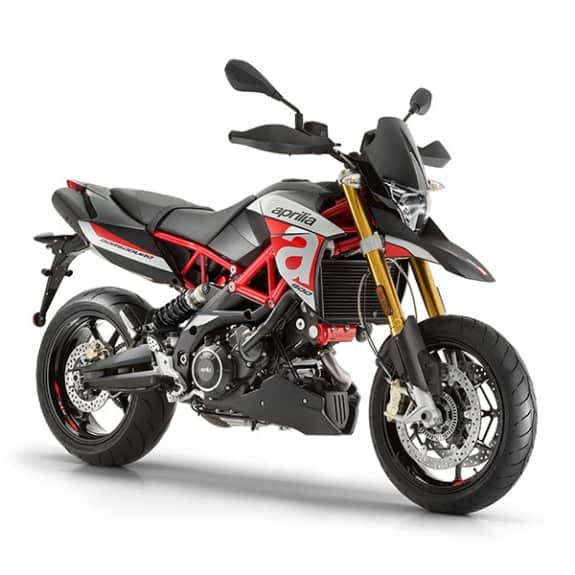 The Aprilia Quick Shift (aQS) works flawlesslyand in realitythe only other gripe I had was with the very smallalmost imperceptiblestep in performance between riding modes. To be fairthey all felt well-tunedwith especially good settings for engine braking and the off/on throttle transition. I remember when BMW decided to reduce the engine braking effect on its S 1000 RR a few years back but went too farultimately making the bike a bit scary to roll through the entrance of a corner. That's not at all the case with this new RSV4. Adjusting aPRC settings via the thumb button on the left clip-on can be a bit frustratingbut I did enjoy being able to adjust the aTC settings on the fly using the push buttons on the same side of the bikewhich were easy to reach and always got me right into the desired setting. 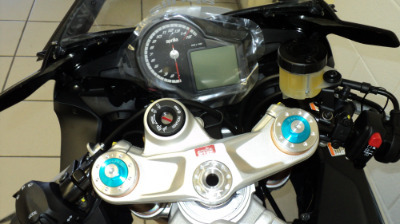 Lastlywhile the RSV4's dash seemed innovative a few years backits now starting to look a bit dated. The chassis isin contrastan absolute gem. It has more feel than anything in the categorywhich ultimately eggs you into leaning it over further than you would anything else and staying on the brakes a little bit longer into the cornerall the while laughing in your helmet and thinkingHow the hell am I still on two wheels? The RSV4 isn't the lightest bike in the literbike segment (Aprilia does say the bike is 5.5 pounds lighter in totalor right around 460 pounds with full tank of fuel)but it still flicks from side to side with relative ease and only feels slightly sluggish as you steer the thing into a corner. I'm not walking out on a limb by saying that this is one of the best chassis in the segmentif not motorcycling as a whole. While the RSV4's dash looked modern a few years backit's starting to look a bit dated at this point. 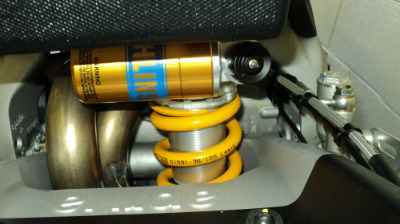 hlins suspension on the RF model (the RR comes with Sachs suspension) is as good as youd expect a fork and shock wearing hlins badges to beproviding great feedback through the stroke and great control. Aprilia had installed track settings prior to us throwing a leg over the bike (i.e. stiffened the bike up via the clickers and preload adjuster)and to be honestI probably couldve raced on the bits and not been disappointed. 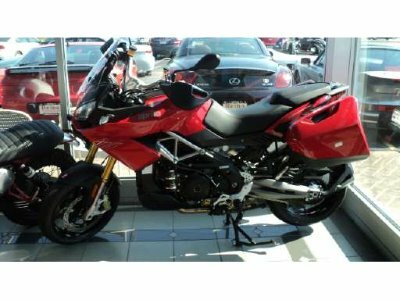 Same with the M430 brakeswhich have great feeland power that felt like it was easy to modulate as you tipped the bike into the corner. The brakes never faded at the track either. Aprilia looks to transform the riding experience even further with an advanced version of its Multimedia Platformwhich allows your smartphone to communicate with the RSV4 and is available as an accessory item. Now you can make changes to the settings for wheelie control or traction control from your phonewhile also getting tips in real time for how to improve your lap time; As part of this "Adaptive Race Assist" featurethe application will compare in real time the rider's best lap with his current lap and indicate if you need to brake or open the throttle to gradually achieve better lap times. Aprilia's V4-MP app (available with iPhone or Android) allows you to program the settings for aTC and aWC so that the bike adjust settings for those systems corner by corner. Notice that in the next sectorwheelie control and traction control will both be reduced. That seems like a bit of a distractionand in fact we didn't really use that feature during the course of our day. We didhoweverplay with the rider aid settingsand walked away completely shocked by its capability. The V4-MP system uses the GPS feature of your phone to recognize your location on the trackthen can adjust the aTC and aWC settingscorner by cornerbased on parameters you selected prior to rolling out on the track. Having a problem keeping the front end down out of the tighter corners in sector 2? Want a little less traction control through sector 3? No worriessimply program those settings in the V4-MP app and the systems will adjust as you run around the track. In addition to thisthe V4-MP app has a "virtual" dashboard that lets you use your smartphone's display to seenot only all the information on the dash but also information acquired by the bike's telemetryincluding longitudinal and lateral accelerationlean angleinstant power and torque distributed to the driveshaftpercentage of power availablerear wheel slippageand more. If running around on a bike that's been developed using data taken straight from one of the most successful teams in recent World Superbike historyand one that enables corner-by-corner adjustment to the electronic rider aid settings via your smartphonedoesn't make you feel like a superherothen I don't know what will. That feeling will come at a cost thoughwith the 2016 RSV4 RF retailing for $21999 and being limited to just 500 units globally. 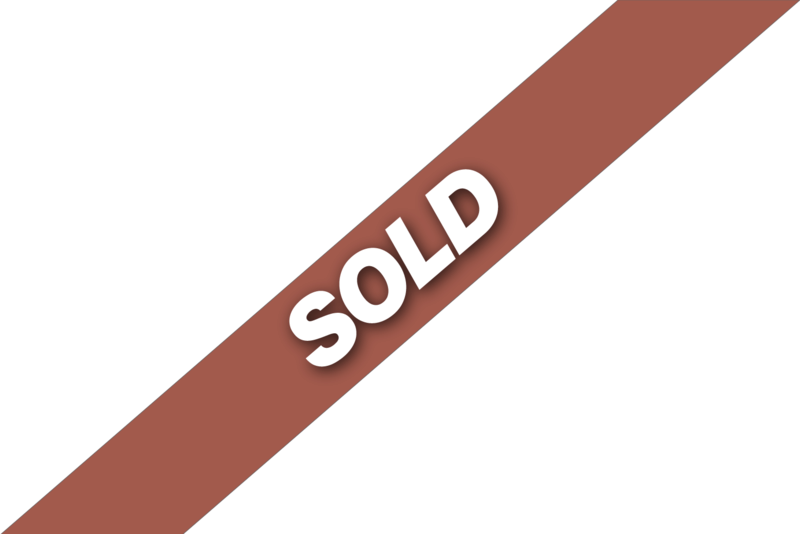 The RRat $15649will cost quite a bit lessand be available as early as September 2015. Something tells us it's no less as charming eitherand we'll be excited to try one out as soon as they hit US shores. Induction Marelli EFI48mm throttle bodiesdual injectors/cyl.